The open workplace design became popular, in part, because it is cheap: putting up walls costs money and takes up space. 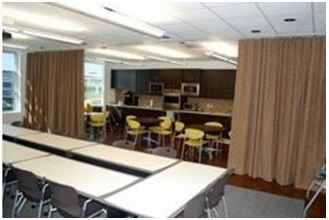 A less expensive solution is to put up virtual walls via curtains in the workplace. Adding workspace curtains can allow you to divide the room any way you like, from one simple divider down the middle, to private cubicle curtains for each employee. The beauty of this approach is that when you need to have open communication and collaboration the “walls” can be tucked away. The use of decorative curtains in this application will warm up the décor, make your employees more comfortable, and improve workplace morale. We offer multiple choices in room divider and privacy curtain tracks that can be mounted to standard or drop ceilings with the use of proper drapery hardware. If your ceilings are high and your panels heavy, you may need the 6200 Heavy Duty I Beam Track. If you want to create privacy for each cubicle, you may need the 88001 Privacy Cubicle Curtain Track or the 6100 Flexible Curtain Track, which can be bent into a curved or angled application as needed. If noise is an issue, the Eclipse Fabric curtain panels, which block light and absorb sound, are your best curtain choice. We want to help you improve your workplace starting today. Let us help you figure out which products are best for your needs: call us at 888-434-7444.